The inner calling of the actor to change a nation can have an unparalled influence on the society. Bill Gates recently tweeted that Toilet - Ek Prem Katha was one of the most inspiring movies he had seen. The year 2017 would be remembered for versatile and social movies in Bollywood Toilet: Ek Prem Katha and Jolly LLB 2, both were based on real issues, which went on to become major blockbusters with collections in excess of INR 100 crore. It has set a new trend in India that calls for cinema to stand for something beyond entertainment - to change the society's fabric by bringing real problems to light and the change makers to life. Akshay's latest movie Pad Man not only marks the arrival of good movies but also intelligent audience, which is more accepting of real issues. Entrepreneur had first met and recognized the work of Arunachalam Muruganantham, the inspiration behind Pad Man in 2013. The small business hero had a compelling story of a man who became the first to wear a sanitary pad in order to come out with affordable sanitary napkins. In 2016, he received a Padma Shri for the revolutionary work done by him and in 2017, we saw newly turned producer Twinkle Khanna chasing him to turn this into a movie. An entrepreneur's journey being retold through cinema gave us a reason enough to reach out to Akshay Kumar on why he picks up social causes for his creative expression and entrepreneurship as a subject for his movies. Akshay has lived his journey perfectly well whether it is his professional career, which showcases his street smartness as an actor based on the movies he chose to be a part of or his personal life, wherein he enjoys beautiful camaraderie with wife Twinkle Khanna. It calls for a lot of balance to live the life of a perfect hero. All this makes his life worth hacking on how he scripted a flawless journey. 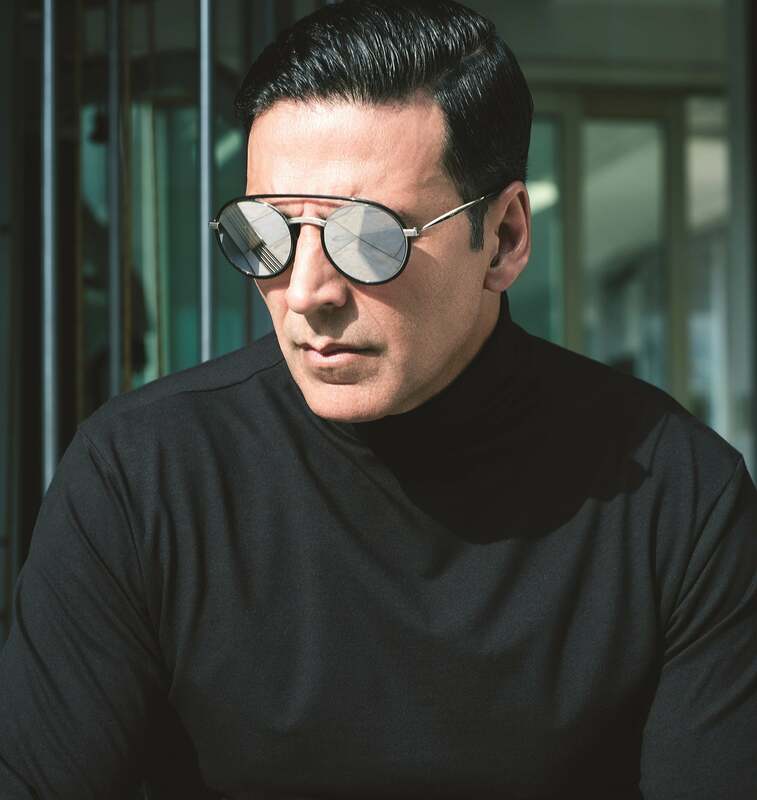 In an exclusive interaction with Entrepreneur India, 50-year-old Akshay Kumar shares more on his journey, start-ups and the social mission of giving back. Looking back, how would you gauge your 27-and-a-half year long career? When I entered this industry, I did not know anyone and I had an initial period of struggle. During this time, I did whatever films that came to me to attain financial stability. Thereafter, destiny kept calling shots and things fell in place one after the other. Over the years, however, I made sure to explore my strengths across genres such as action, thriller, comedy, romance, social drama, etc. along with the filmmakers who showed confidence in me. And now, I feel I have reached a certain point where I can experiment with roles and stories which are challenging but at the same time, very commercial. What keeps you going even today? The urge to keep working and being passionate about my work is what keeps me going. We must constantly try to adapt with the changing times. In reel life, I try to be as close as possible to the character that I play, to do complete justice to the role. But at the same time, the real me has to play the part with conviction. For example, the story of Pad Man is one such story that I strongly feel and care about even in my personal life. Hence, hopefully you will see the conviction onscreen as well. Your choice of cinema strongly addresses social causes. What are the issues do you strongly feel about and how do you feel start-ups could make a difference to change our nation? As an actor, I have a platform through which I can influence and if not make a difference directly, but at least create some awareness among the masses on various social issues. Through my upcoming movie Pad Man, the common notion is that we are trying to educate the Indian population about the importance of using sanitary napkins. However, when one would watch the movie, they would realize the movie celebrates innovation, entrepreneurship and perseverance. I hold entrepreneurs in extremely high regard. Any economy that strives for growth, rides on the back of its enterprising population. In India, the youth these days is experimenting with a lot of innovative products and services which involves stepping into a completely unchartered territory. Also, we have recently seen some social entrepreneurs coming up who are constantly striving to make our lives better. I wish them all the success. Do you relate yourself to an entrepreneur who takes calculated risks, which at times are insane but are only known to him? To fulfill your dreams you have to take risks. Now if you succeed, they become calculated risks and if you fail, they become insane risks. I have tried my hand in multiple careers before joining films and they were all a part of my journey that have at times been fruitful and at other times given me experiences of life. In fact, a lot of my films have been unconventional in terms of the subject that is being dealt with. However, if I am convinced with an idea and the script, and if I see that conviction in the director, I give it my 100 per cent and leave it up to the audience to decide the rest. As far as practices are concerned, I feel that in order to be successful, one needs to be greedy and extremely disciplined. The greed will keep you going and the discipline keeps fueling the ability to keep you going. If Akshay Kumar had been an entrepreneur, what business would you choose and why? I am extremely happy being an actor even though it happened to me by chance and now I don't think I could ever be anything else, it was my calling. And I am grateful to my audience for accepting me and loving me enough that now I am in a position to tell stories that I feel for. I want to keep working, keep making films and keep entertaining people till I can. What defines your choice of films and the choices you make in life? My choice of films usually depends on the scripts that are offered to me. At the end of the day I am an actor who is here to entertain the audience. Luckily for me I am getting the opportunity to communicate important messages in a very commercial and fun way and that is what I think leaves an impact on the people because even they come to the theatre to be entertained. What made you believe in Arunachalam's story? It was my wife Tina who came across the story. She got all excited and fortunately she and my director R. Balki were convinced that I would be able to essay the role onscreen. The movie talks about a character who loves his wife unconditionally and unconventionally. Unlike the typical image of men in our society, he is compassionate. Inventing a machine that manufactures affordable sanitary pads was also a part of one such effort that he put in out of sheer love for his wife. That instantly got me hooked to the character. And after I learned that in India, sanitary pads are currently used only by around 14 per cent and others adopt unhygienic methods during menstruation which leads to diseases and infection, I wanted this message to reach out to millions of people to enlighten them about this serious issue. What kind of camaraderie do you share with Twinkle as a working couple considering that she is the producer of the movie? Any lessons you would want to give to other couple-preneurs? She is my superwoman. Just one thing I would want to tell all the couples out there - take pride in each other, be it personally and professionally and love and support each other at every step. You will succeed in life at times and falter at other times but your bond should always stay strong. In order to be successful, one needs to be greedy and extremely disciplined. The greed will keep you going and the discipline keeps fueling the ability to keep you going. Is there any other young Indian/global entrepreneur or any person who has inspired you with their work? Yes there are loads of them, each one has a story that inspires you. The two people that I have been close to for my characters in Airlift and now Pad Man are respectively Mathunny Mathews (the Malayali entrepreneur who coordinated the evacuation in Kuwait in 1990) and Arunachalam Muruganantham (inventor of a low-cost sanitary pad making machine). Which all innovations you think can change the world? Any areas you are passionate about yourself? Any innovation that can bring about a positive change in the society can make the world a better place to live in, interests me. It can range from health and sanitation to education to individual and collective well-being. How do you think each one of us can be a superhero in our lives and bring a change to our lives and society? One cannot become a superhero by himself in one's own eyes, it is something what people around you make you. When providing happiness and well being to your loved ones becomes your ambition in life, then is the time when change begins to happen and people start looking up to you. People call you the ambassador of evolution, how do you react to it? One has to constantly adapt with time, like they say change is the only constant. In my case, it was pure love for my work and the urge to tell new stories that brought about that evolution. Also I feel the directors that came to me were in some way ahead of their time and they approached me with such stories. I love working with new directors as well because they come with fresh ideas. Irrespective of my working schedule I ensure to make time for my family, be it a meal together, a movie outing or an exotic holiday...all my time is theirs.